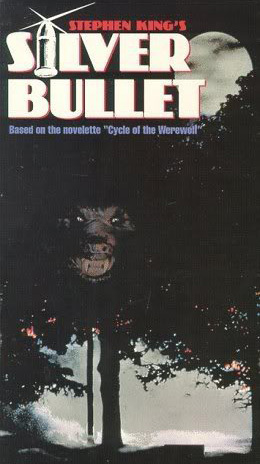 ‘Silver Bullet’ was based on the Stephen King novella ‘Cycle of the Werewolf’, and helmed by Daniel Attias. Odd choice, as he was best known at the time for directing ‘Miami Vice’. Unusually for a werewolf movie, ‘Silver Bullet’ isn’t told from the point of view of the werewolf, but rather from the ordinary brother and sister caught up in its small town killing spree. The werewolf is out and out evil, both in human and beast form. Unusual too is that it’s a whodunit mystery – no one knows which member of the community is howling at the moon. With a standout performance by Gary Busey as Uncle Red, ‘Silver Bullet’ should be high on any list of guilty pleasures. Great to see this movie continuing to draw attention to itself some 27-years later. For those interested I’ve just spent the best part of a year making a feature length documentary on the making-of An American Werewolf In London. You can find out more in my website link. I love best the Wolf Man movies with Lon Chaney Jr. All of them. I was just a kid when i would stay up late to watch Shock Theater, which came on Friday nights at 11:30pm. I loved Dracula and Frankenstein. But, the Wolf Man was my favorite. I am so looking forward to the 2009 remake of, The Wolf Man. a) It’s 22 years you idiot,learn how to count. b) top advertising your myspace profile everyvere. MY FAVORITE !. This movie had to be in the top 5. It’s quite perfect in every way. Yes I think it’s better than “An American Werewolf In London”. That movie was more about the transformation scene. I love that you have a more humanoid looking creature. Plus the fun and the action and horror combo is tops. WHERE’S PROJECT METAL BEAST ?!?! Err Nik, American Werewolf was made in 1981, which would make it 27-years old. So he’s right. So not only are you terrible at spelling, but I think your maths are at question, not Paul’s. Also, I had no idea a new DVD was coming out until I saw that Myspace, so it’s not like there was any trolling. First order of business, excellent list. Spot on with my own opinions for the ones I’ve seen… will have to check out the few I’ve not. That being said, one humbly submits that this particular review is in need of a small correction. I do not believe that David Kessler kills Jack Goodman. The same werewolf that injured Kessler and caused his transformation is the creature that killed Goodman, was it not? WHAT??? Underworld is the BEST! Agree about Van Helsing though. Underworld though, is awsome! I can’t figure out what EVERYBODY has against that movie! The Wolf man is the ultimate classic, and Dog Soldiers was an awesome new age pure werewolf movie. Hi! I was wondering if anyone knew tons of werewolf movies because I remember a movie that I saw and I just don’t remember the title!! It was an amazing movie, I would love to see it again, but of course with my horrible memory, I FORGOT!! :O…here’s a plot sinopsis. It took place in a small (prob 18th century) village that was in the middle of the woods. There was a high barrier made of wooden stakes surrounding the village and in the middle of the village was a graveyard where all of the victims of the werewolfs were bueried. The village had been attacked by a werewolf( there was a bloody hole in the wall around the village) and people were being infected everywhere. Many people were bitten and soon became turning into werewolfs, but the process took several months…..I dont remember much, but I will say a few Key parts. There was a small boy that was bitten, I can still remember his half transformed face (btw, when you become a werewolf, u stay a werewolf). There were two girls, one with brown hair, and another with a light hair color (i think) the one with the lighter hair color was bitten by the little boy. I remember the little boy in the middle of the village, stroking a dead hand that seemed to be his dead mothers….the villagers caught him in a net and killed him after that. I remember this movie haveing a very creepy aura, and the deformed looking little boy would always pop out of the shadows! PLEASE PLEASE PLEASEE tell me if you know what movie i;m talking about! I just with I remembered what it was called! AHH! Amanda, sounds like THE COMPANY OF WOLVES to me. The movie you are thinking of is Ginger Snaps Back: The Beginning. It is the third in the Ginger Snaps series, though it does not have anything to do with the first two, same actresses aside. If you liked this one, you should watch the first one. I like Ginger Snaps unleashed. The little girl is a great film Psychopath and the rehab theme is handled more realistically than in films like Girl Interupted. The original Wolfman is the best because most of what we think of as werewolf mythology stems from that film. I went through a stage of liking Underworld. I just thought there was something about it. Then a lady-friend pointed out that I just liked watching Kate Beckensale running around looking pensive in a rubber suite.